The 13-acre Fireman’s Field park is located in the heart of the Purcellville Historic District and contains the last remaining vestiges of “Dillon’s Woods,” the Town’s most significant remaining urban forest populated with trees ranging in size from small dogwoods to majestic centuries-old white oaks. The park includes the historic Bush Tabernacle skating rink (built in 1903), two baseball fields with the main one selected as the site of the Babe Ruth League World Series in 2013, the sixth time the youth baseball organization has chosen Purcellville as a World Series destination. Fireman's field is home to the Purcellville Cannons, a baseball organization who is part of the prestigious Valley Baseball League, which is NCAA Sanctioned and supported by Major League Baseball (MLB). Today, Fireman’s Field park hosts numerous events, concerts, receptions, antique fairs, roller skating parties and is home to the annual Loudoun Grown Expo, Music and Arts Festival, Wine and Food Festival, and sports activities. The Fireman’s Field property is listed on the state and national registers of historic places. The first gatherings held on the location of the Bush Tabernacle and Dillon’s Woods were temperance rallies, called bush meetings, organized by the Good Templars of Loudoun County. A one day event was organized in June 1877 in which the Good Templars of Loudoun County hosted a Temperance Picnic featuring speakers, food and music. In 1878, the Grand Temperance Bush Meeting was created an annual, three-day event held in Dillon’s Woods; where sermons and lectures were given on a platform constructed for the event. People would come to Purcellville through the train station from Washington, DC, to hear the prominent speakers, while the Good Templars would be dressed in their regalia and a parade would walk the crowds from the train station to Dillion’s Woods. In 1903, The Bush Tabernacle was constructed with a roof, sliding doors, wooden benches and a dirt floor to host meetings and events, while maximizing capacity. The Bush Tabernacle was a place where people discussed and supported prohibition, gathered for social and religious events, lectures and even adult summer camps, known as Chautauqua’s. The Bush Tabernacle and grounds saw many changes in the years to follow. According to Northern Virginia History Notes, in 1937, the complex was used as fair grounds for the Loudoun County 4-H Club. The Purcellville Volunteer Fire Department started using the complex in 1939 to host a carnival and ended up purchasing the property with community funding in January of 1947. They wanted to create a recreation area for local youth to keep them engaged through community activities. The name, “Fireman’s Community Center” was the submission to a contest to name the facility and was submitted by Mrs. James A. Cummings. The Tabernacle was used for dances, roller skating (once the floor was installed in or around 1936) and beauty pageants. The Town of Purcellville purchased the entire complex from the Purcellville Volunteer Fire Department in 2008 and it was added to the National Register of Historic Places effective May 28, 2010. Since 1878, the grounds of the Bush Tabernacle and Dillion’s Woods have been a place for the community to gather to meet neighbors, socialize, participate in educational, cultural and religious events, and discuss political policy that would impact Loudoun County and the growing nation. For more information on the history of the Bush Tabernacle, please visit http://www.novahistory.org/Purcellville_Rink/Purcellville_Roller_Rink.html. This site was used for research for this content. Shaun Alexander Enterprises, Inc. – Shaun Alexander is highly sought after for speaking and consulting in the areas of leadership development, family living, sports camps, faith based camps and strategic business development and is part of the management team for the Bush Tabernacle. The company was founded in 2006 after Shaun Alexander won the NFL Most Valuable Player in Seattle. He now resides in Northern Virginia with his wife and eight children. 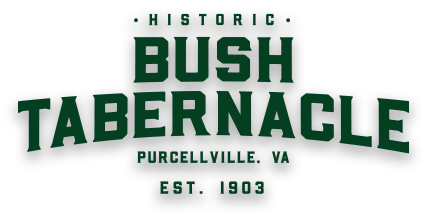 Purcellville Teen Center Inc. was founded in 2005 to operate the Friday night Teen Center, and they subsequently expanded to provide the day-to-day management of all activities at Bush Tabernacle.